Contains xylitol to help prevent plaque, zinc citrate to control tartar, and silica for whitening. What is Natural Care? Our philosophy of Natural Care guides us in doing what is right for our customers, employees, communities, and environment. This product does not contain saccharin, artificial sweeteners, preservatives, colors, or flavors, or animal ingredients. Tom's of Maine products are tested for safety without the use of animals. When we founded Tom's of Maine in 1970, we based it on the idea that nature has answers to our everyday needs. Over the years, our team of herbal experts, dental health professionals, and scientists has proven our original belief: ingredients from nature really work. What makes our products so effective? We use natural ingredients in innovative ways without adding anything artificial. From toothpaste and mouthwash to soaps and deodorants, we think you'll enjoy the effectiveness and natural flavors and scents of our products. Xylitol fights plaque. Xylitol is a natural ingredient derived from birch trees which helps in the prevention of plaque buildup. Zinc citrate controls tartar. Zinc citrate is derived from zinc, a naturally occurring mineral, and helps control tartar buildup. Silica whitens teeth. Silica, derived from sand, improves cleaning and removes stains that form on your teeth over time, making your teeth whiter. Fluoride-free formula. Some people do not want fluoride in their toothpaste. We produce our Antiplaque Tartar Control plus Whitening Toothpaste without fluoride because we respect our customers' diverse needs and interests. Take the five-day flavor test. Our natural flavor comes from pure peppermint oils. It is never artificially sweetened with saccharin (400 times sweeter than sugar), so give your taste buds a chance to adjust. 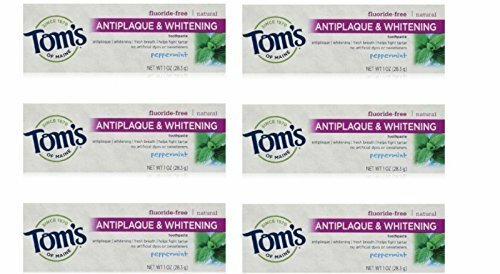 Use Tom's for five days, then try your regular brand. We'll wager you'll stay with the clean, refreshing taste of Tom's. Tom's tarter control plus whitening toothpaste helps control plaque buildup and whiten teeth naturally. Zinc citrate, a naturally occurring mineral, interferes with the calcification of plaque into tartar. Natural silica gently whitens by removing stains that form on your teeth over time without using bleaching ingredients or harsh abrasives. We use delicious natural flavor oils, not artificial flavors or sweeteners.